While in Tokyo, I saw an Ultimate Fighting Championship event at the Saitama Super Arena. Ultimate Fighting is a mixed martial arts competition where fighters can win by knockout, tap out, or points. The fighters come from a range of disciplines including striking styles such as boxing, karate and kickboxing along with submission styles that include aikido, judo, and wrestling. Fighters compete within their own weight class, but fighters of one style can be paired against any other style. This means you get matches between boxers that want to keep their distance and use punching power against submission fighters that want to take the fight to the mat and bend limbs in the wrong direction until their opponent taps out. 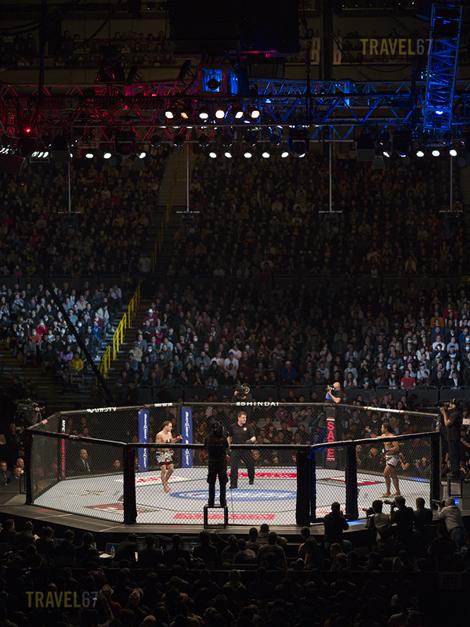 The bouts take place in a octagon with wire walls rather than ropes. You definitely get the feeling you’re watching something not far removed from gladiatorial combat. The stadium atmosphere, however, was more friendly and reverential than bloodthirsty. The Japanese audience clapped and cheered for fighters from all countries, the greatest cheers were for combatants who used their skill to wriggle out of submission holds, or land an impeccably timed blow. 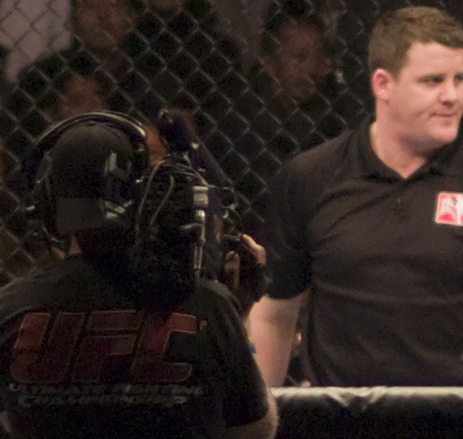 The second from main fight was between Quinton “Rampage” Jackson and Ryan Bader. Rampage Jackson, who played B. A. Baracus in the recent A-Team movie, found that his plan didn’t come together and was beaten on points by unanimous decision. The main fight was between Edgar and Henderson. Henderson won on points in what some described as a close match, but to myself, the layman, Henderson looked like the far superior fighter. At the end of the fight Edgar was bruised, battered and exhausted. Henderson looked like he’d just done a light jog on the treadmill. Overall a fascinating day. A big thanks to Dave Webb for inviting me along and then having to explain what was going on most of the time. Also with reference to the last blog this was a good example of why it’s useful to have lenses that remain sharp at wide apertures. The image above was shot handheld with the 150mm lens and at f2.8 sharpness was not an issue. Great to have you come along Chris, and I’m glad you found it interesting. Because the Edgar-Henderson match was so close, a rematch has been pencilled in for this summer – should be another great fight. Very nice shot you got there, too. Am impressed, as always. Hi! Chris-san Long time no see. I am afraid you do not remember me. I am following you blog all the time. You are long on Okinawa. Is it becoming too long and are you thinking to move to any other place of the globe ? I have two questions to you. I would be very happy if you could answer my questions. 1. Are you bothered by dust problems with your Pentax digital 645 camera ? The camera appears does not have a low pass filter. 2. Do you use a foreign provider for this page? I use a Japanese provider “Nifty” for my English HP. I have inconveniences to set up English blog and emai for my HP.